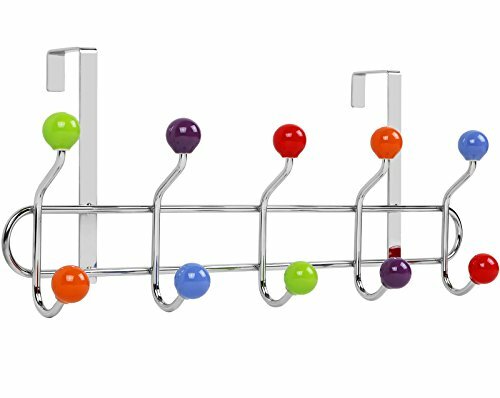 Get rid of the clutter and manage unused space in your home adding instant storage with this elegant Over the Door 10 Hook Organizer Rack. Without the need for installation, this unit provides hooks for hanging and organizing backpacks, coats, umbrellas, purses, belts, towels, bathrobes and more. Made of durable steel, with multi-color ceramic knobbed hooks. Stylish look and ideal for kids room. Brackets fit doors up to 4 cm thick (most standard interior doors). For smoothly opening and closing the door with these hooks, be sure there is a gap of a coin thickness (1.5 mm) over the door.